Be sure to use a cooking pan that is made for non-stick frying. A good quality frying pan is very versatile for low temperature frying. Never use a nonstick pan on high heat, it will destroy the nonstick surface. Use nonstick pans for frying eggs and meats. The disadvantage of nonstick, is that food does not stick to it when you might actually want the food to stick liken when trying to create a fond, or when trying char food for extra flavor. Nonstick pans can be used for just about anything, but should not necessarily be the first pan you use for cooking everything. You will want to keep your nonstick pan for cooking particular things, otherwise the nonstick surface will wear over time. It’s best to dedicate this type of pan for certain things, eggs being one of them. 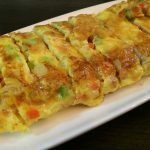 To make Korean Omelet, start by preparing your ingredients dicing and placing them in a bowl with whipped eggs. Make sure to cook this on a low heat with patience. Do not try to roll the egg when it’s not done yet. You will break it! Once your assembly line is ready, then follow the instructions below.